Try these alternative pasta and gnocchi recipes by Caroline Bretherton – utterly delicious whether you follow a gluten-free diet or not! 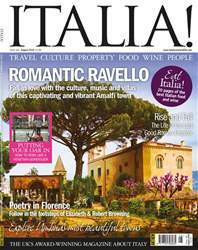 Our cover star, Ravello, clings to the cliffs above the panoramic Amalfi Coast and is a perfect starting point for our travels this month. Take a stroll through this vibrant town to discover a place where faith, music and creativity flow.